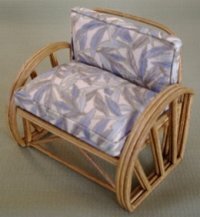 Fine quality 1:12 scale handcrafted miniature Rattan furniture and accessories styled after the vintage Rattan furniture of the 1920s thru 1960s. 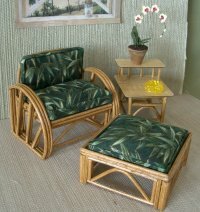 This furniture is perfect for the miniature "Florida" or "California" rooms or any tropical setting. 1:48 scale miniature Craftsman furniture with designs in the styles of Mission, Stickley, Mackintosh and more. Our 1:12 and 1:48 scale miniature Art Deco and Contemporary furniture will be available soon. There is a shortage of miniature Art Deco and Contemporary furniture and accessories and we filling that need. Make sure that you sign in and register for our newsletter so you will be the first to know when new items are made available. E-Zee™ Tiles are easy to work with acrylic miniature tiles that come in various sizes and a wide range of colors. Imported from Thailand these E-Zee™ Tiles can be sanded and cut for the perfect fit. Opaque pastels are great for the 1940s & 1950s Kitchens and faux marble tiles are perfect for an elegant entry. Faux Glass Blocks - can be an inexpensive solution to simulate Glass Blocks in a Bath, Wall or Window. Bunka Rug kits from area rugs to small throw rugs are especially designed for miniature rooms and to complement a wide range of Rattan furniture, Art Deco décor and Contemporary furnishings.